Magdalena, NM; July 13, 2017 – For Immediate Release – The Taylor Canyon Fire, located on the Magdalena Ranger District, is now at 4,336 acres. The lightning-caused fire started on July 6 and is located in Taylor Canyon, 55 miles west of Magdalena, NM, in the San Mateo Mountains. Increase in fire size today was primarily due to hand ignition operations. Interagency cooperation between BLM and the Forest Service land management resources allowed 2,000 additional acres to be treated in the fire area. 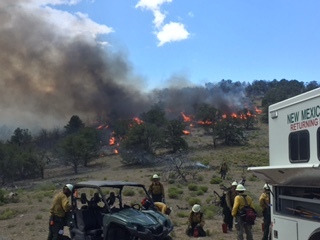 The fire continues to burn in Ponderosa Pine, Pinyon, Juniper, and grass on both Forest Service and Bureau of Land Management lands. Precipitation occurred in the area of the Taylor Canyon fire yesterday, and further monsoonal moisture is in the forecast this week. “Safety of fire personnel, accurate and timely information to the public and adjacent land owners as well as interagency cooperation have been and will continue to be the priorities on this incident” according to the Taylor Canyon Fire Incident Commander Trainee Brent Davidson. Approximately 62 personnel are assigned to the Taylor Canyon fire. Resources include two Wildland Fire Modules, one Type 2 Initial Attack Crew, three Type 6 Engines, one Type 4 Engine, and one Type 3 Helicopter. Resources from the U. S. Forest Service, Bureau of Indian Affairs, Bureau of Land Management, New Mexico State Forestry, Returning Hero’s Program; and the City of Rio Rancho are currently assigned. Decisions related to management of this fire will be based upon minimizing exposure and risk to fire fighters. Hand ignitions will continue along the west and south perimeter of the fire. Additional aerial ignitions on both BLM and Forest Service lands may continue, weather permitting. The fire is being managed to achieve multiple resource objectives, including improving wildlife habitat, protecting cultural resources, reducing hazardous fuels, and returning fire to the ecosystem. All decisions related to management of this fire continue to be based upon minimizing exposure and risk to fire fighters.